Start with 3.75mm crochet hook, make a slip knot, facing the good side of the bottom place the knot into the 12th hole from corner. Make 2 sc into the same hole, 2sc in each hole around and 3sc in each corner hole. In the end place a stitch marker into the last stitch, and a stitch marker into the 8th stitch from corner, change to 5mm crochet hook. Round 1: 1sc in each stitch around until the stitch marker, 1sc into the stitch with stitch marker. *Place the stitch marker again and avoid the stitches between stitch markers. Round 2: chain 1, turn, 1sc in each stitch around until the stitch marker, 1sc into the stitch with stitch marker. *Cut a plastic canvas piece 26 holes long and 36 holes tall. *Sew the piece in the front side of the bag. Round 22: with 3.75mm hook or smaller, go back to round 21 and make 1sc crochet in each hole across the plastic canvas. In the end change to 5mm crochet hook and make 1sc in each stitch around until the end of round. Round 23: 1sc in each stitch around. Round 24: 1sc to the 1st stitch, 2sc together around. * In the end cut the yarn, finish your work and hide the tales. *You can sew a pair of wooden handles. 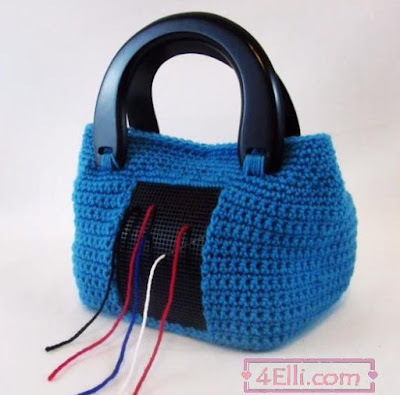 You can watch our video tutorial witch shows you how to crochet this beautiful bag step by step.